The weather here is dull to say the least and it has rained almost all day. Plus it looks to be quite windy. 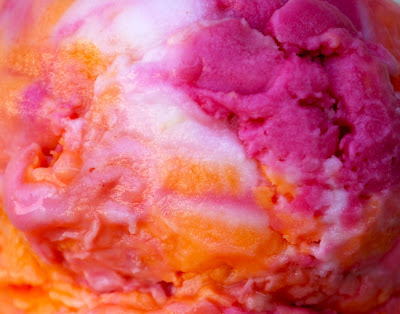 So it was a pleasure to be working with the bright colours of shocking pink, orange and yellow which make up Rainbow Sherbet the inspiration ice cream for week 1 of the Summer of Color: Ice Cream Inspirations. And here is my journal page inspired by the ice cream. I really like the text on text, it makes it really pop. This is gorgeous, love the quote as well. Very nice! I haven't done mine yet...but I can't wait! I love the layered backgrounds in these. And of course, those colours are gorgeous. Lovely work - I particularly like the texture on the background - very effective. Beautiful! Love the flowers and how you've highlighted them in white. Makes them pop out from the gorgeous background! Wow! Your work really really shines! Love your inks and colors and layers and drawing with such a great quote! You've really managed to capture the right sherbet feel with those colours!! LOVE this!!! Great words to live by! Lovely page and great reminder to SHINE! really pretty. i find it impossible not to doodle daisies on almost everything. you have the perfect background here for yours. and the white highlights bring it to life beautifully. this is smashing!!! love the color combo for this piece! Great quote and lovely artwork. Your artwork is lovely Bernice... love the quote too!... looking forward to your week 2 now!! Love the quote - and love the artwork - simply beautiful!